Though roses can be tricky I show you how to paint pretty pink roses one stroke at a time. 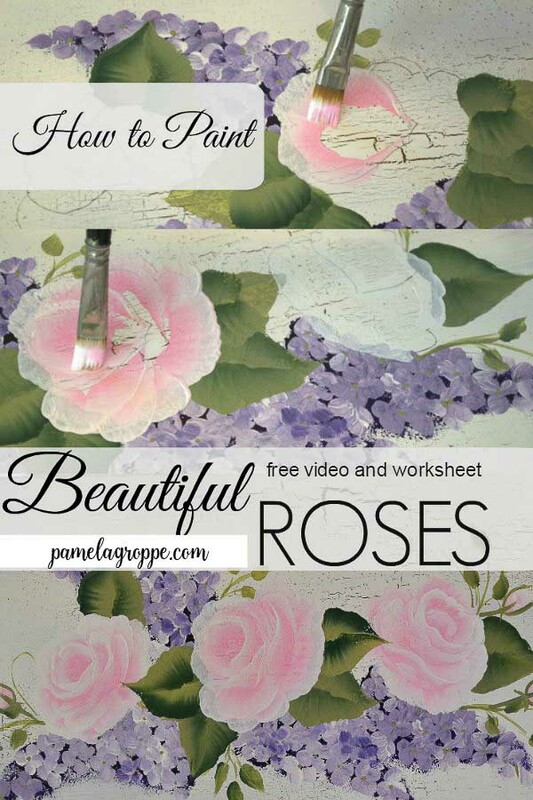 A free video and worksheet are available below to help you get painting roses fast. Are you ready for another painting tutorial? but believe it or not they are really fast and easy once you get the steps down pat. I am going to show you stroke by stroke of how I paint my roses. The video is great because I paint 3 roses in a row and it displays how each is a little different and you can watch that at the end of this post. 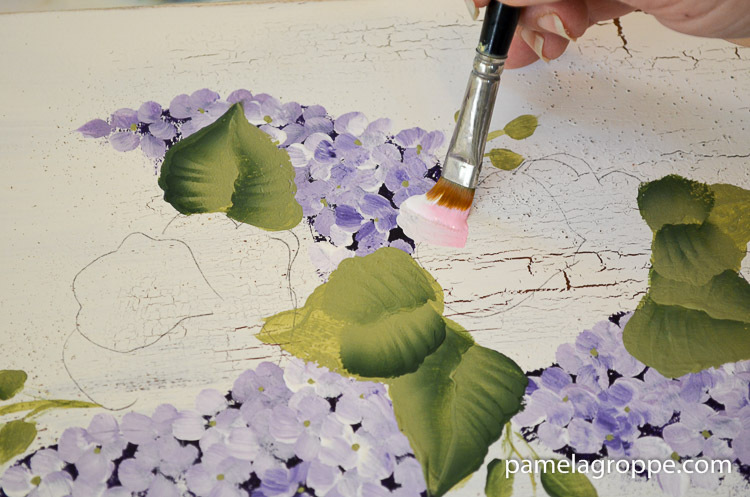 stroke an upside down U.
I wiggle my brush as I stroke to get some movement in the petal. See the bit of wave in the petal? I did the outline of the design on my board with the graphite much darker than I normally would so you could see it in the photos. Typically it is so light the camera would have a hard time picking it up. This is the actual design that will be in my pattern packet. Since this bowl is a little wider I don’t do another layer..
but my video does show me demonstrating a rose with a third layer in the bowl. I dab in the pink on the corner of my brush to fill in the center. 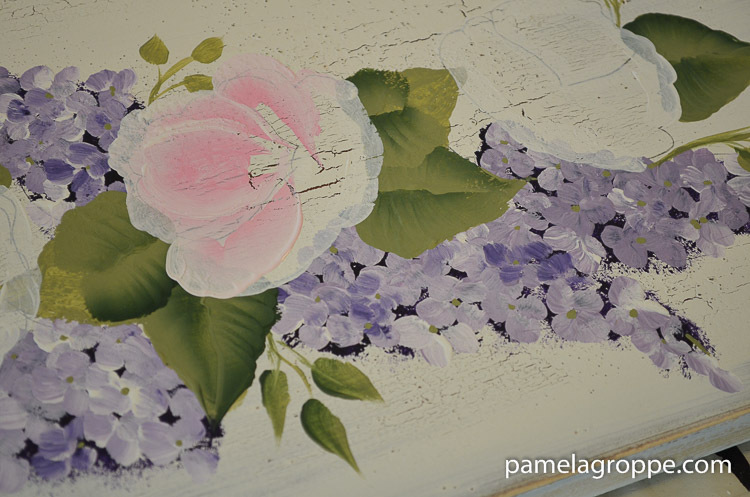 Sometimes I add a darker value of pink here to accentuate the center of the rose. Before we finish up the bowl we put in the bottom petals..
Start the chisel edge on the side or on one of the tails of the very inner bowl and make a scalloped U stroke. Attaching it to the tails on the other side. The next petal is a variation of a U stroke. Start your brush on the tail edge of the very back bowl and make a varied U stroke. As you can see this one only came halfway across the center bowl or maybe it looks more like 3/4. 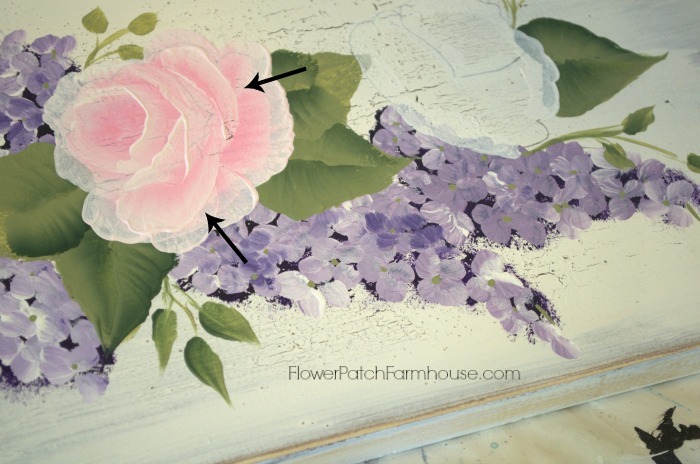 Now there is several ways to do this to make the roses vary so play around with it and get different looks to your roses. Now add the next arms, scalloped C strokes again..
You do this on each side of the bowl and the tails come over the bowl somewhat. This could be the finished rose or you can do a fancy stroke that I could not demonstrate in a photo. For that you really need to see the video. The first time I show you the tricky stroke is at 3:06 on the video. You can do a few chisel strokes here and there as you feel it needs. I hope you whip out those brushes and paint, paint, paint. Want a worksheet that breaks down the steps for you? 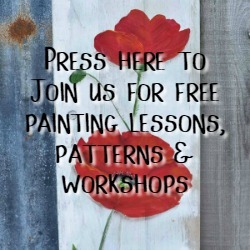 Want to get updates when the latest paint tutorial is posted and get access to the free printable patterns? Fill out this form and join us. Already a subscriber? The Password is at the bottom of every email I sent out so you are already in. 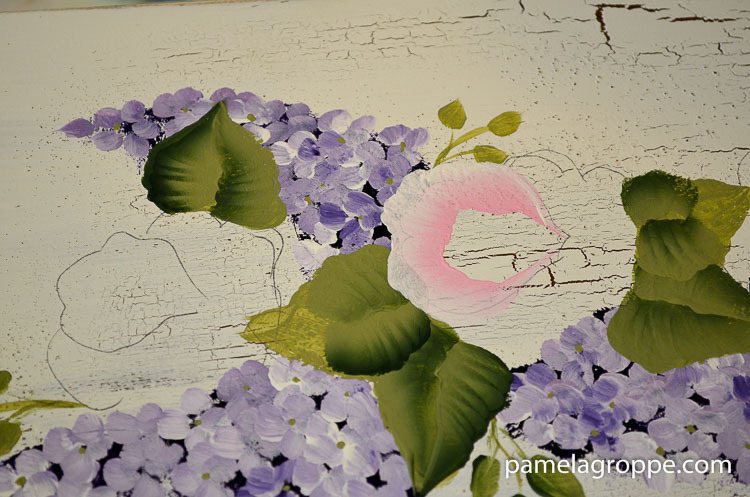 Come on back, I will include a tutorial on painting the lilacs and leaves. I enjoy your painting so much. The beauty of the object and colors. Thank you for sharing your art talent with us. You are welcome, Sheila, I do enjoy sharing as much as painting. Just keep on and you will gain confidence and skill. 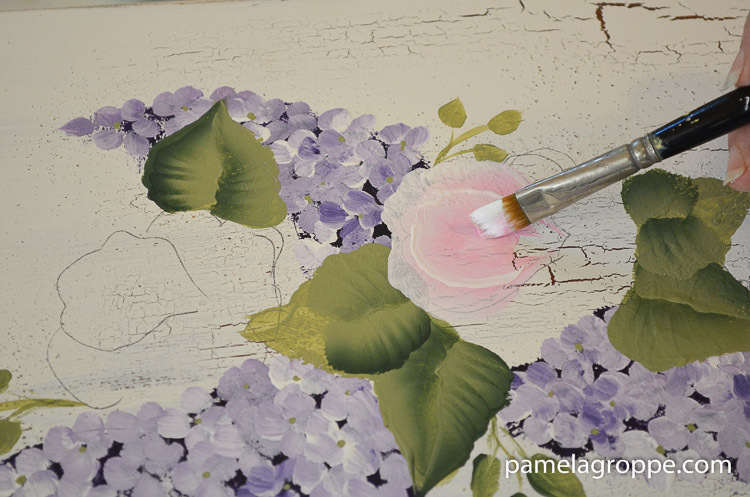 I am still always learning new ways to paint and see things in different ways! 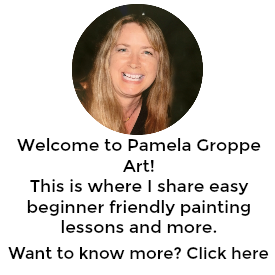 Thank you for sharing your expertise, love it. Your roses are yummy. I love the way you break down your painting into manageable steps. Thank you for sharing your tips and techniques. Thank you for sharing this, I have just gone part time, bought a shed and I am learning to paint my favorite things – flowers! After watching your tutorial, tomorrow I shall start practicing roses! I doubt it is quite as easy as you make it look but fingers crossed, I am inspired, thank you again. hI Pamela…I AM BACK AGAIN TO COMMENT ON ROSES. Pamela,,i THOU=GHT IF I WERE EVER,,EVER GOING TO MASTER ROSES,,IT WOULD BE ON YOUR SITE WITH YOUR VIDEOS,,,BUT I HONESTLY THINK I HAVE 2 LEFT SIDES TO MY BRAIN,,LOL,I’m still having a heck of a time!!! !,,,,I just cant seem to get that pne tricky part no matter how hard I try,,,,did you have this problem???? no problem with other flowers tho,,,I’m stumped….any tips????? You can also not do the tricky step but just add more chisel strokes. It does take practice and being less critical of what your style tends to be. From the sound of it you have been practicing quite a bit. Maybe I can try to break up that tricky step into 3 steps to make it a bit easier. Let me work on that and I will post a link when I am done. Keep Painting and you will get there! Its great that you keep on trying and haven’t given up. I would like to see how you load your brush so I can see how much of each color you use. If you need more just let me know and I will do a short clip and post it. Thank you so much. You are extremely talented. Thank you for sharing it with us. Thankyou for the beautiful paintings and the way toy teach us to paint. You’re most Kind.